Friday, Dec. 28, 2012, 5:21 a.m. EST. The full moon of December is called the oak moon. Other names are frost moon, winter moon, long night’s moon, and moon before Yule. In Hindi it is known as margashirsha poornima. Its Sinhala (Buddhist) name is unduvap. The full moon rises around sunset and sets around sunrise, the only night in the month when the moon is in the sky all night long. The rest of the month, the moon spends at least some time in the daytime sky. The last full moon of 2012 will rise into the night sky this week in a year-ending lunar treat. 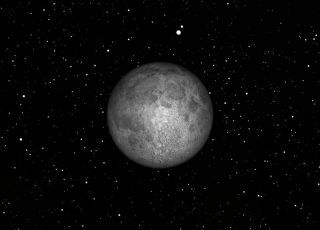 The full moon is actually an instantaneous event when the moon is exactly opposite the sun in the Earth's sky, and this month that occurs on Friday morning, Dec. 28, at 5:21 a.m. EST (1021 GMT). But, to the naked eye, the moon "looks" full for a couple of days on either side of that time, so the exact date doesn't matter. Many owners of new telescopes are disappointed when they look at the planets. At its largest, the planet Venus is just barely one arc minute in diameter, about 1/30th of the diameter of the sun or the moon, and all the other planets appear smaller than that. Even if you don't own a telescope, looking at the moon with the naked eye can show you the challenges faced by planetary observers. Earlier this week we saw Jupiter shining brightly alongside the moon. It would take a telescope magnifying about 40 times to make Jupiter appear as big as the moon does with the naked eye. When Mars was closest to Earth in 2003, it took a telescope magnifying 75 times to make Mars appear as big as the moon with the naked eye. At present Mars on the far side of the sun, and requires a telescope magnifying 430 times to make it appear as big as the moon does with the naked eye. So, if you want an observing challenge similar to trying to spot Jupiter's Great Red Spot or Mars' polar cap, try observing detail on the moon with your naked eye. What most people see when they look at the moon is "the man in the moon." This is a pattern of light and dark caused by the albedo markings on the moon. “Albedo” is a measure of how much light gets reflected by an area on a planet. Darker areas on the moon's surface, which the early astronomers called "seas," although we now know that they are dry and airless, form the face of a man, in our mind’s eye. Or, they may form a woman, or a rabbit, depending on your culture. These are very similar to the dusky markings which astronomers observe with telescopes on Mars and Mercury, also called albedo markings. If you try to sketch the markings you see on the moon, you will find, as experienced planetary observers do, that you can see much finer detail than the man in the moon. You should be able to see some of the smaller seas, such as the Mare Crisium, on the eastern limb of the moon, and one or two of the brighter craters, such as Tycho towards the southern limb. Once you have tried to sketch the moon with your naked eye, try observing it with a small binocular. You will be amazed at how much more detail you can see, and will begin to experience the wonder Galileo must have felt when he first turned his primitive telescopes on the moon. There really is another world out there. If you snap an amazing photo of the year's final full moon on Friday and would like to share it with SPACE.com for a potential story or gallery, submit photos and comments, including your name and location to spacephotos@space.com.